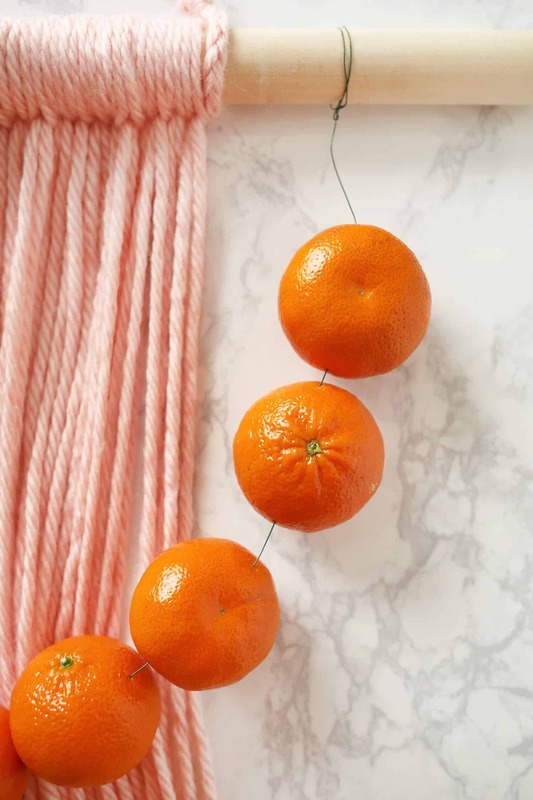 Measure how long you want your yarn strands to hang from your wooden dowel, add two inches, and then double that. 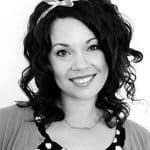 Use this strand as your template to cut the rest of your strands. Another easy trick is to just make them as long as your wingspan if you’d like this part to go faster. Cut about 60 of these. You may need more but this is a good start. 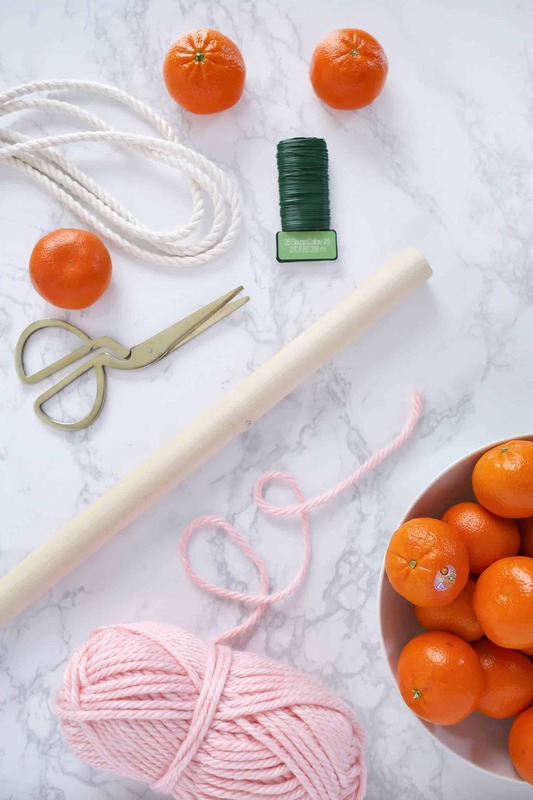 Lay your dowel on a surface and create a Lark’s Head knot with your first strand of yarn. You can do this by folding your strand in half and placing the loop under your dowel rod. Then wrap the loop over the dowel rod and pull the two ends through the loop. Tighten by pulling on the loose ends. Repeat this with the rest of your strands so that they are consistent. You shouldn’t be able to see much dowel rod in between your strands as you add them. Cut more strands if you need them. 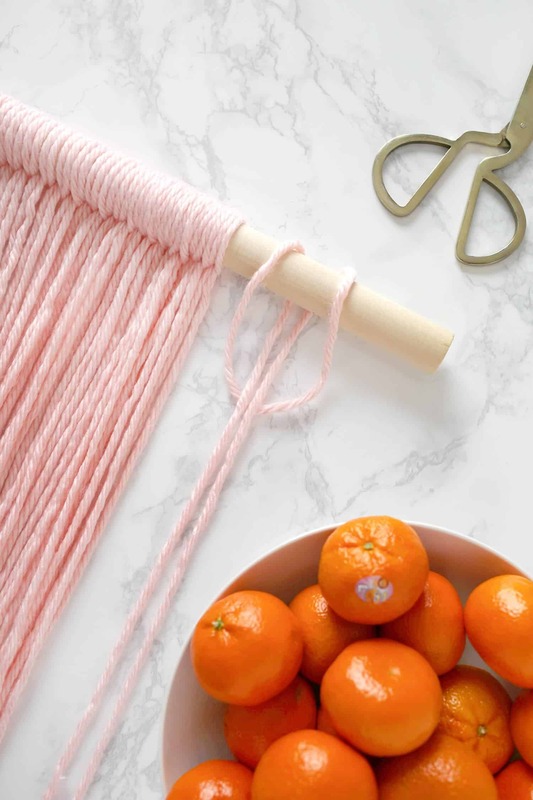 To make your hanger, cut three strands of yarn that measure 5′ long each. 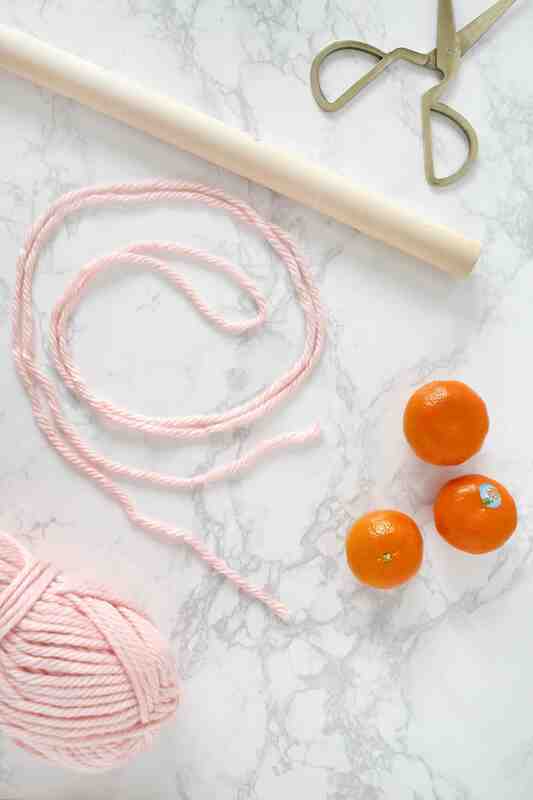 Braid these three strands together and then knot one end on either side of your dowel rod. Trim your ends. Cut a 6′ length of wire and straighten one end. Hold your Wonderful Halo so that you can pierce through the widest part of the fruit. It won’t always go straight through, but as long as it isn’t right under the peeling, it’ll hold. Gently slide each fruit down until you have about 22 on your wire. Since the wire is so thin, you shouldn’t have any problems with your fruit leaking juice everywhere. 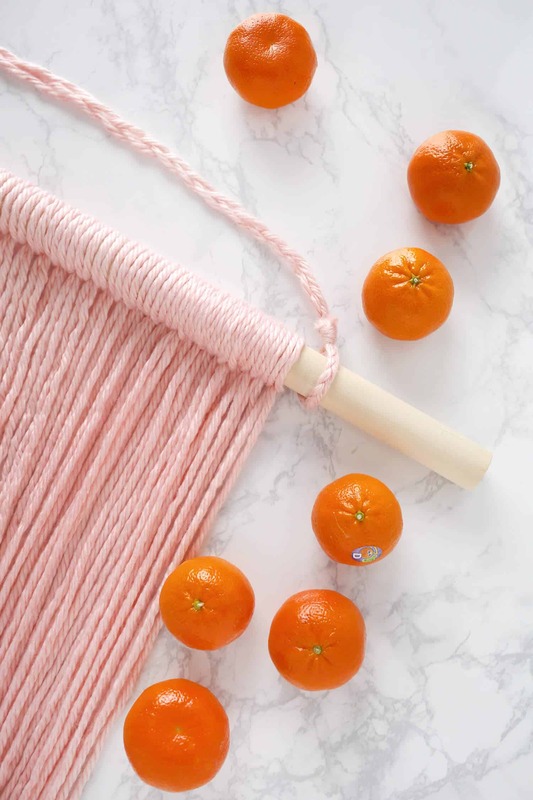 On a flat surface, tie both ends of your wire twice around your dowel and then twist your ends tightly. 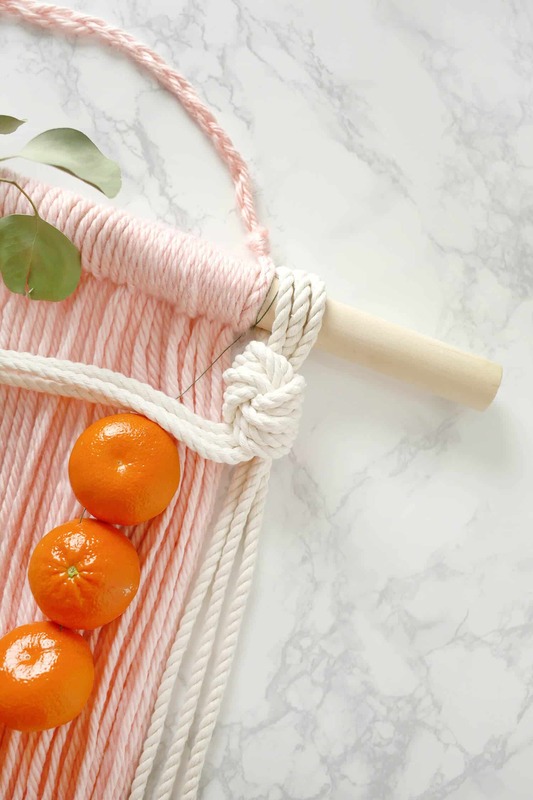 Slide the wire on the dowel until it’s next to your hanger. Cut three equal strands of rope. Holding all three strands, measure down about 2.5′ and tie a loop knot. Make sure your loop fits gently over your dowel rod. After you’ve secured one knotted end, drape your strands so that they are halfway between the dowel rod and your strand of Wonderful Halos. 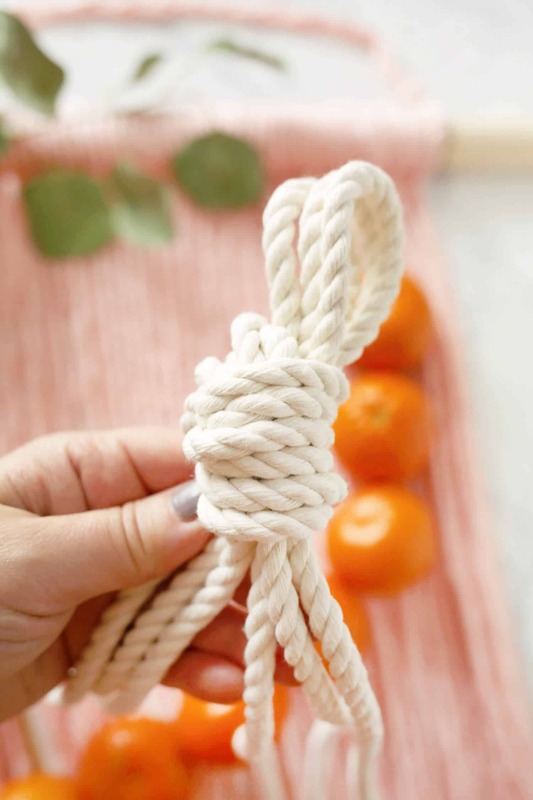 Tie another looped knot with your rope and add it to the other end of your dowel rod. Trim both sides of your rope if they’re uneven. 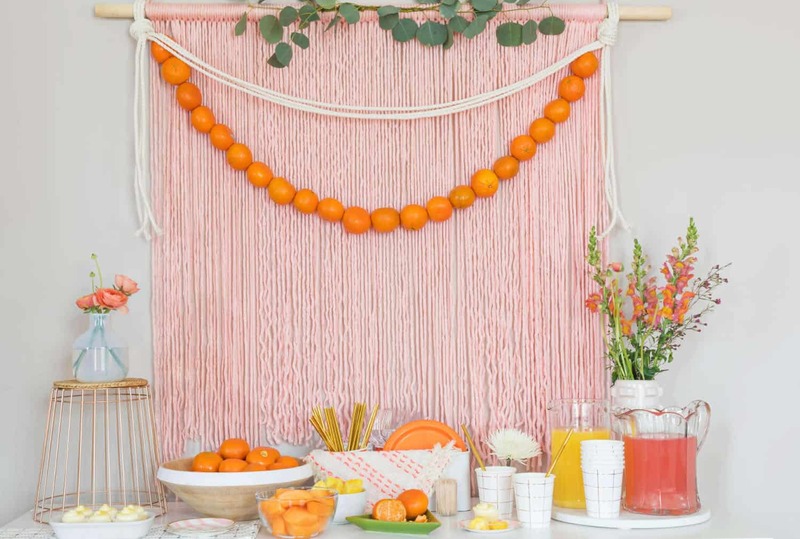 Add some eucalyptus or other leafy branches to the center of your dowel with more wire and hang up your new party backdrop! 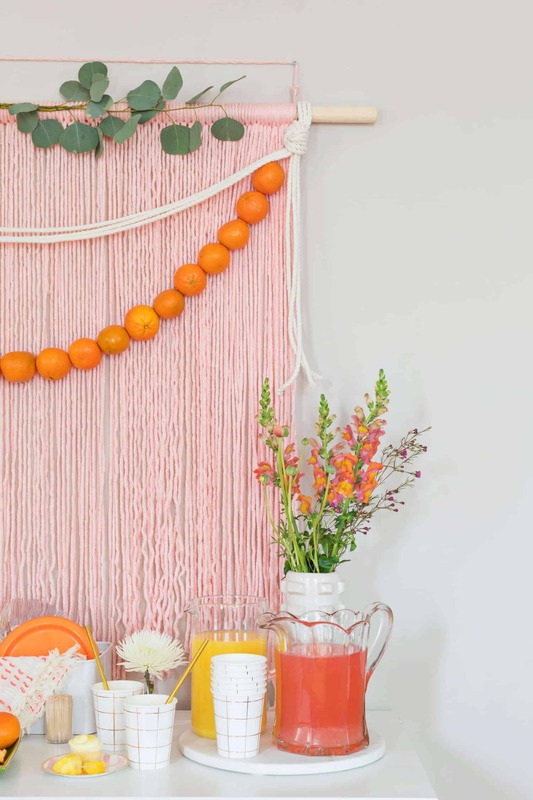 I’m loving these edible decor ideas! I love that they get to be enjoyed instead of stored in an attic a majority of the year. 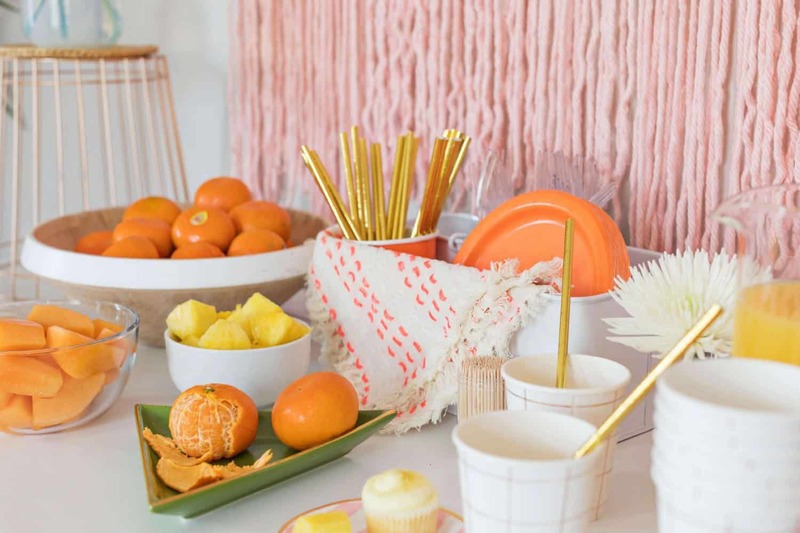 Orange is such a beautiful and vibrant color for celebrating. Yes! It does double duty! 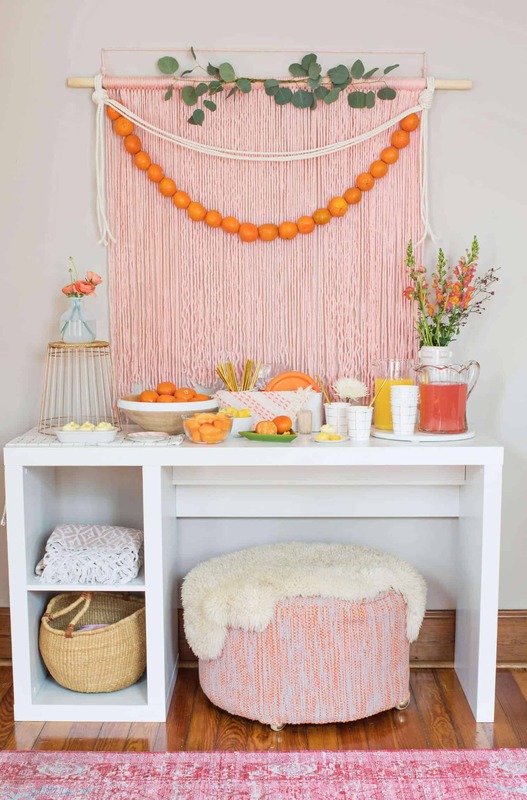 Pink and orange felt so perfect for spring! Hi! 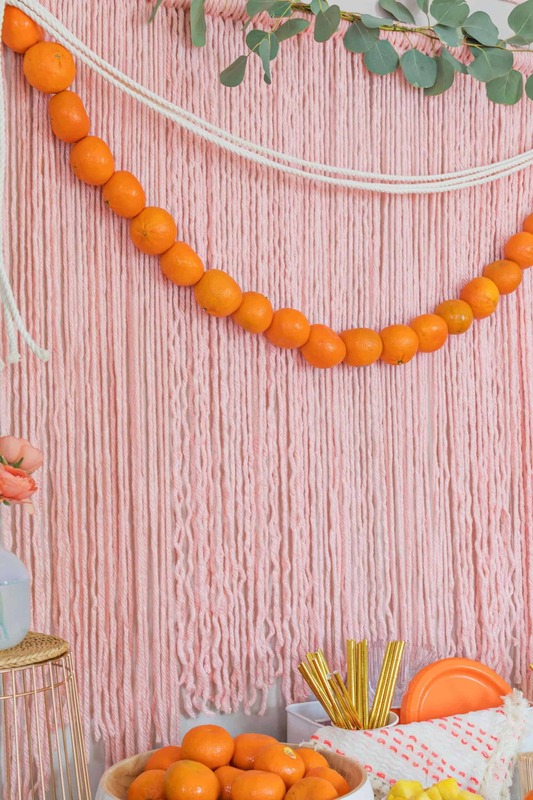 Did you leave the clementine garland out for a week? If so, how did it fare? 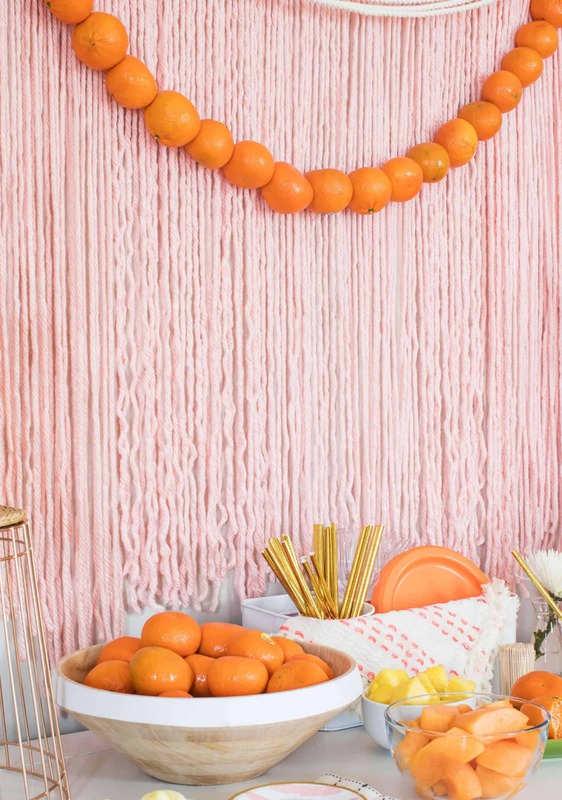 I’m thinking of making a garland with a string of clementines and magnolia leaves for Christmas! OMG! It looks fabulous. So pretty! My cat would hate you for this! Yes, it’s just one of those mean ways to taunt our kitties, huh!! 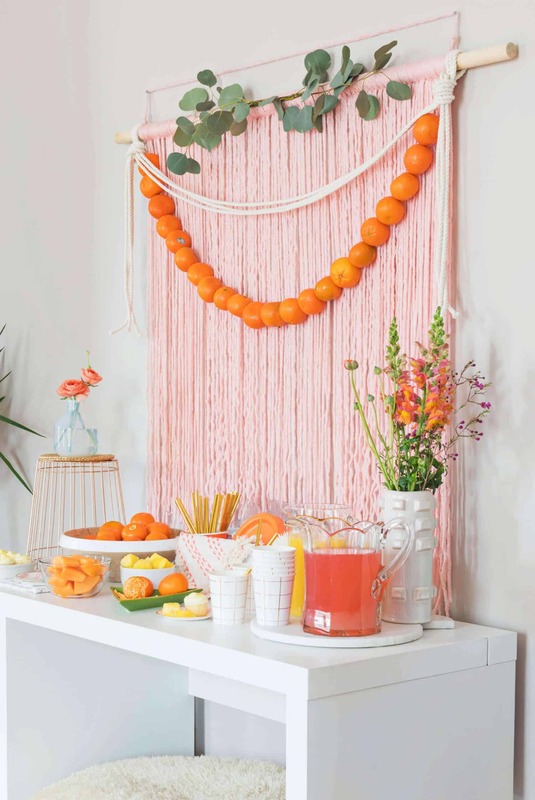 What a beautiful colour combination, I love the idea with the oranges! Yes! They made that job easy! 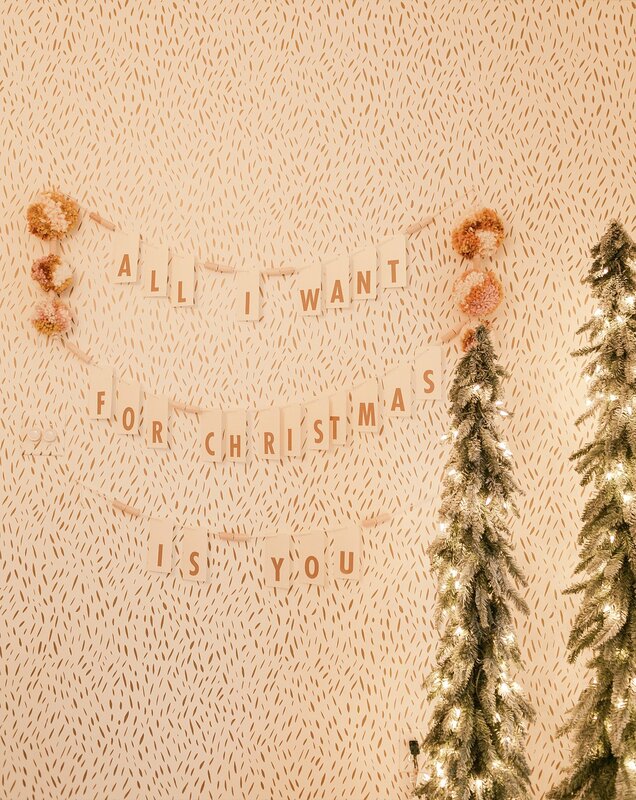 This is such a beautiful and effortless DIY! I love it so much! I love that you said effortless because that’s how I wanted it to feel! It did take a major DIY fail to get to this point so it was also about as far from effortless as possible. Ha!!! Legit beautiful! And looks like something I could make. Thank you! Thank you! 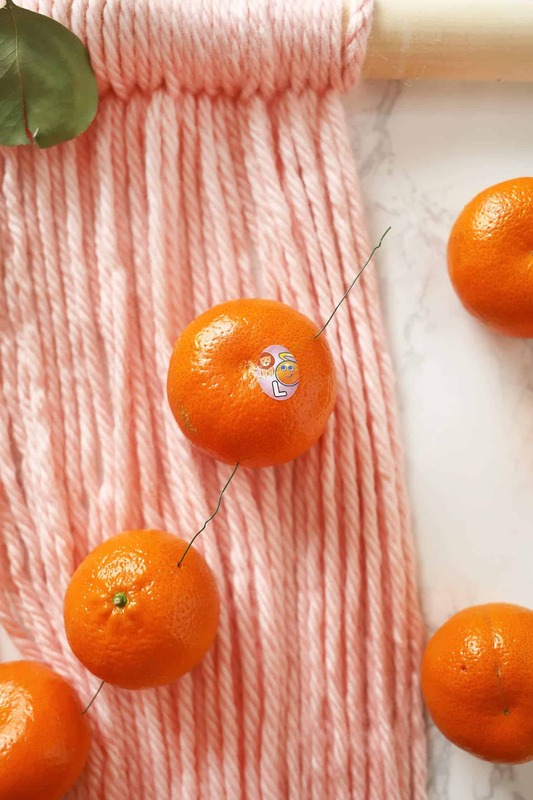 You can’t go wrong decorating with beautiful fruits and flowers, huh! I keep hearing what a fun and amazing thing this is, I can’t wait to do it for myself. Hi Rachel, can you source the white desk for me? Been searching for one just like it. Love this! I’m going to try this here in Florida! Thanks for the cool ideas!